While MCKINNA YACHTS are perfectly at home cruising the inland waterways, it is offshore where they really hit their stride. That’s where MCKINNA’s unique design and engineering shine. Uncanny balance. An unbelievable steadiness of ride. Incredible response. MCKINNA YACHTS run level and sure-footed in demanding seas and never cease to impress as they make their way into port. 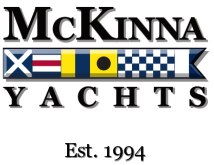 At MCKINNA YACHTS, the objective is not just to build yachts, but to build better yachts. Superiority rules in all aspects of building a MCKINNA YACHT. We use high-tech composites as the primary construction material for the hull, soles and bulkheads providing additional strength and sound absorption while reducing weight and offering fuel saving advantages. Efficiency and excellence is key to the design of a MCKINNA hull. We utilize cutting edge technology in applications essential to performance, operation and safety. Propeller pockets reduce the shaft angle and provide fluid power transfer while reducing the draft. Attention to interior ergonomics and the use of an expanded beam create volume and open layouts usually found on much larger vessels. In every way, art and science collaborate on the new “experience tested” hulls, designs and tooling. MCKINNA YACHTS works to create an experience that exceeds expectation with first-class customer service and flexibility of design choice. Every member of our fleet is tailored to showcase the owner’s design aesthetic while retaining a superb ambience of casual opulence. The interior workmanship of a MCKINNA YACHT is an artful melding of woods and fabrics fashioning an alluring and inviting air. Shapes and contours soften the look. Informed details emphasize quality of design and luxury of lifestyle. When you look at a MCKINNA YACHT pay very close attention. You will find attention to detail and attention to your desires. This is what you should expect from a luxury yacht! The new line of MCKINNA YACHTS really does represent a whole new way of thinking – your way of thinking. Mr. Espinosa is well regarded in the industry and has dedicated his efforts exclusively to the exterior and interior styling of custom yacht and production boat industries. His firm’s design work is published regularly by the most prominent publications in the field. Espinosa has provided a new modern-elegant look to MCKINNA YACTHS, followed by a complete re-design of the product line including systems, materials, workmanship, and above all the implementation of stringent quality control to guarantee the lines complete success. He provides a modern, stylish exterior design that houses a functional and open arrangement. Furthermore, the interiors incorporate finely detailed joiner work, exotic wood veneers, leathers, stones and appointments usually found on much larger and more expensive yachts. The new MCKINNA YACHTS reflect the elegance and attention to detail that say “JC Espinosa”. DLBA is an internationally recognized naval architecture/marine engineering firm offering technical design services for the development and construction of state of the art marine craft. Since 1989, the firm has specialized in the design, evaluation, testing, and construction management of motor yachts, custom sportfishing boats, production boats, and military/paramilitary vessels. The firm also directs research programs to develop and/or extend technologies that advance mariteim applications. DLBA is a leading designer of custom designs with projects having been constrcuted on four continents. The advanced designs are noted for their high speed, and superior ride quality during transit to the vessels final location. The designs also provide excellent maneuvering and control of boat motions during low speed operations. Renowned Apollonio Naval Architecture, Howard Apollonio’s firm, offers leading-edge yacht and commercial craft design, engineering styling and space planning for a wide range of diverse and advanced craft, including modern and traditional monohulls, catamarans, trimarans, SWATHs and hydrofoils. His 35 year professional career has included twelve years with propulsion and builders of advanced commercial and military craft. He has spent 23 years running his own firm, which has primarily focused on the design and engineering of motoryachts of all types. Apollonio vessels operate as a professional engineering entity, able to meet the most stringent requirements for safety and seaworthiness, as well as structural and mechanical integrity. At the same time Apollonio insists on producing vessels that are very good looking, well proportioned, and of long lasting style. They all incorporate important human engineering factors that make each boat a pleasure to be on, featuring light and visibility, with enough space to easily move about. His designs for MCKINNA YACHTS represent the epitome of form and function.